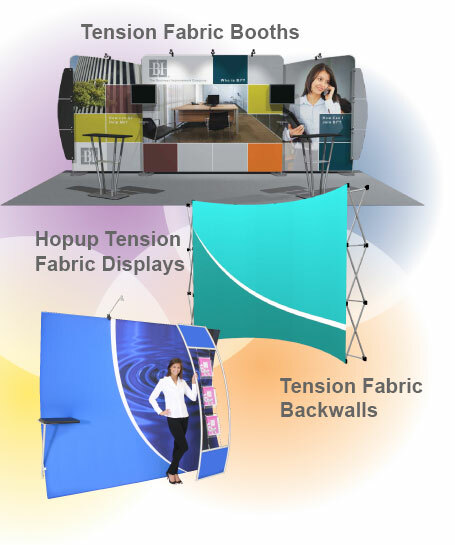 Tension Fabric Booths are a light-weight, portable display system with multiple design possibilities. Its aluminum, tube frame structure assembles quickly without tools. A tension fabric, washable, pillowcase graphic slips effortlessly over the frame. Unique shapes and a host of accessories create a style that is functional and compelling. Tension Fabric Backwalls are advanced aluminum structures with fabric graphics. Some kits include: front curved accents, low voltage lighting, tabletops and/or counter, literature pockets, headers and top accents.